Whether you’re building a mailbox or a deck, choosing the right wood is important to a well done project. 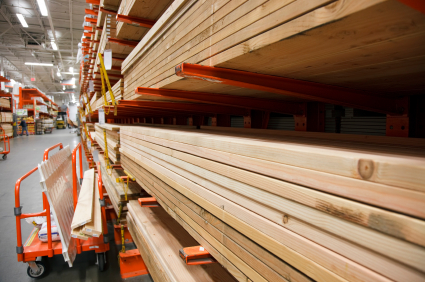 There are many different wood choices you have for your project, each with a different grain, color, and cost. So what are the nicest, longest lasting woods? Cedar is a popular choice for many wood projects. It’s has a heavy red tint to it at the beginning of its life. 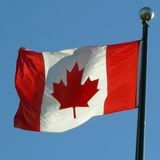 Cedar is known for holding up in the elements quite well, eventually aging to a nice silver or grey color. Mahogany is a wonderful choice if money isn’t an issue. This wood gives your deck, mailbox, or porch a very luxurious feel to it. It’s a brownish color and has very tight grains. Synthetics are a choice for many people. Synthetic wood has a few advantages, it’s very easy to install. Usually you can just lay the beams in place and glue them together. Since it’s not real wood, it holds up better than real wood. It’s extremely durable, water proof, and can withstand the elements. However, there are always downsides to using these installations: looks. No matter how good the product is, you can never really imitate real wood. It’s glossy and doesn’t give the appearance of real wood, but is a very nice substitute. Beautiful back yard patio spaces and custom stamped brushed or stained concrete patio pad to increase home value quickly and help you sell your home fast. Increase the value of your home and help with a quick sale. A concrete pad on your property with some basic landscaping and flowers will be a cool place to enjoy summer home barbecues and outdoor living with beautiful garden patios. You can practically see concrete used everywhere around you. Various structures including buildings, houses, and roads are made out of concrete. Basically a few reasons make concrete this important; it is inexpensive, versatile, and a very strong material. However, like most of the other materials, concrete can also get damaged therefore it is important that concrete sealer should be used in every home’s surface to keep it protected. Building a house is not a joke, it is very big investment and owners will make sure that it is maintained in every way possible. Repairing the structure in the future might cost a lot of money therefore keeping it protected already will be a wise move. For this reason, using a concrete sealer can make sure that your concrete surfaces stay strong for a lot more years. Concrete surfaces need to be protected with concrete sealer so corrosion and deterioration can be avoided. Being a porous matter, concrete can easily absorb water therefore chemicals and moisture can easily damage it. Concrete sealer makes sure that this absorption does not take place and all the destructive substances are unable to get through its layer and enter the concrete. When a concrete surface is not sealed, it is vulnerable. Over the time such unprotected concrete will continue to absorb water and moisture and soon it will start to break or crack. This usually happens to sidewalks, driveways, garages, floors, and other concrete surfaces found in a home. You can really not avoid deterioration on concrete surfaces like garages and pathways because vehicles and humans continuously pass by therefore it is necessary to use concrete sealer on such places that are at most risk. 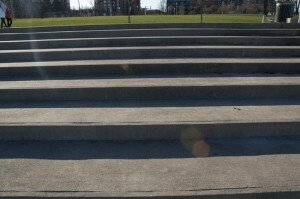 Along with all these factors, concrete can also suffer from damage when the weather changes. 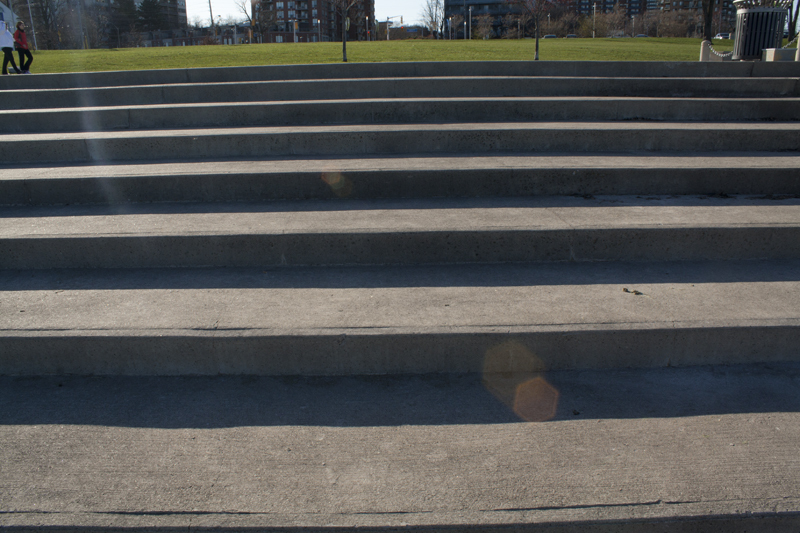 Extreme changes can be pretty damaging; if the climate suddenly goes from hot to cold, concrete surfaces will get weak. If you are living in a place where it can get extremely cold in winters and extremely hot in summers; your concrete surfaces need urgent protection with concrete sealer. Not only using concrete sealer will make sure that your concrete surfaces stay protected and last long but it will also give a much better and fresher look to the surface. 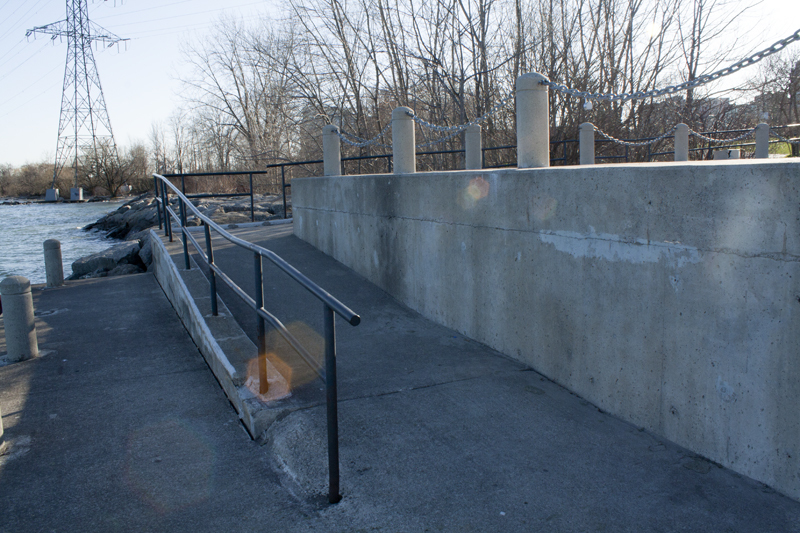 It makes the concrete look cleaner and newer for a longer period of time. Always use a high quality concrete sealer to get maximum protection. If you happen to live in a town house or new development you probably have a home with a door that is several stories above ground level. Having a tall deck with stairs leading to the top would be the perfect space and entrance solution to your new home. The best tall deck ideas can always use a little inspiration, so here are a few examples of tall decks. 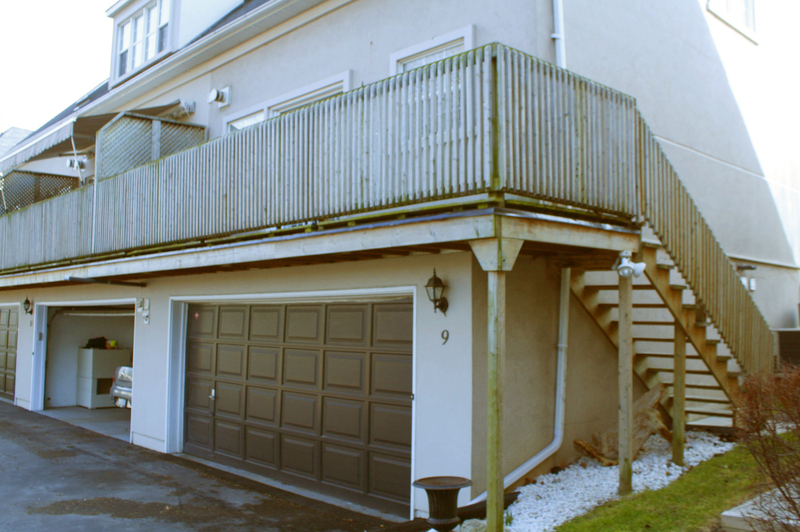 As you can see in the picture, this tall deck has stairs with relatively easy access and the deck is suspended above a sunken garage. In this particular home, the garage leads into a fantastic finished basement. The deck provides easy back door access to the living area, and also provides ample space for a bbq and chairs. This tall deck idea is not only appealing, it serves a major access function with the parking and back stairs. 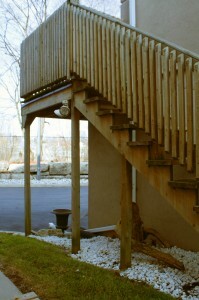 Tall deck stairs are generally anchored to the side of a home for more support with massive lag bolts. This is necessary for lode baring purposes as seen in the picture above. 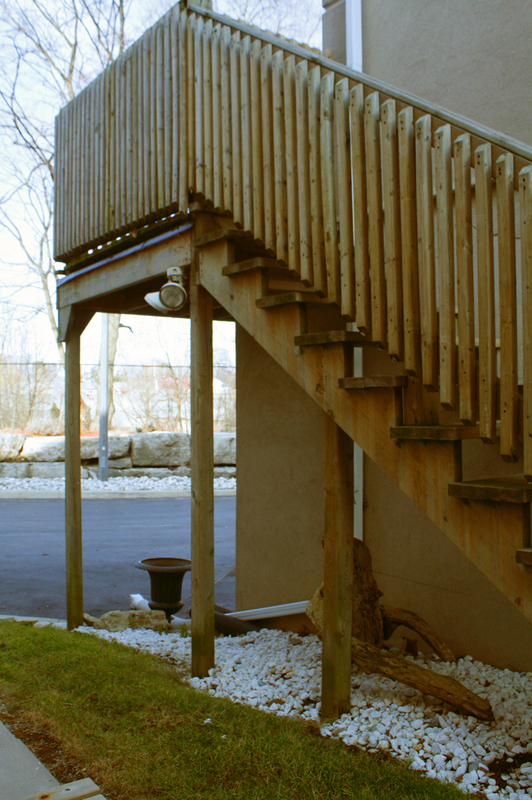 The lag bolts and pillars provide the needed support for these tall deck stairs. Tall decks such as the one pictured here are a great addition to any town home or a house with a second story exit door. Imagine the convenience of having your BBQ right outside your kitchen on a new cedar deck?